Esperanza Elementary School is welcoming a surprisingly new visitor to the urban downtown campus, a winged wonder that both students and faculty hope will stick around a little longer. 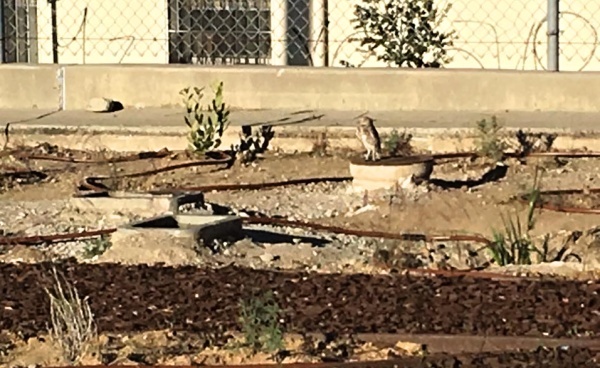 A burrowing owl, more commonly found in the grasslands and deserts, has been seen regularly at the inner-city school (located just blocks from MacArthur Park) which just recently restored green spaces around its campus and nearby Wilshire Boulevard. 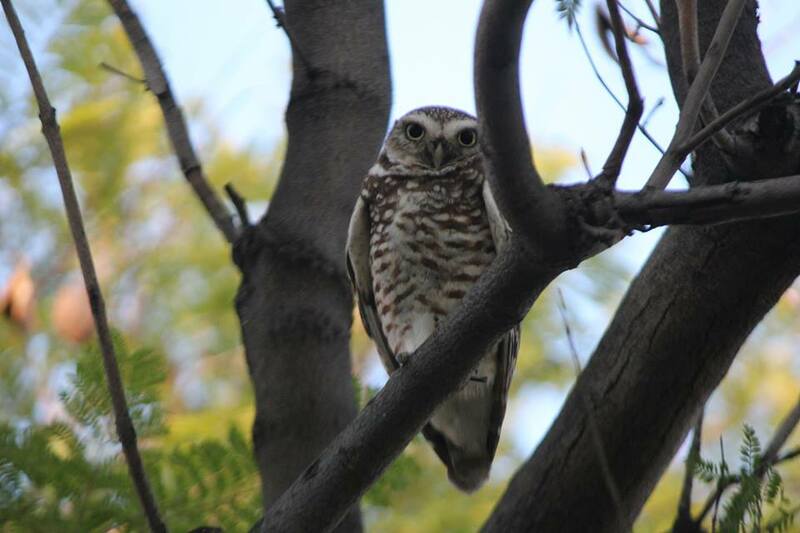 Esperanza’s owl was first discovered on Tuesday, Nov. 30, and has been hanging around ever since, says Brad Rumble, principal of the PK-5th grade school that serves 800 students. “It was a fourth grader Nathan, a true birder, who saw it first,” says Rumble explaining that the long-legged, yellow-eyed predator was discovered among the branches of a courtyard coral tree. The tree’s location – near a second story breezeway – offers prime viewing of critters that inhabit the mature tree. Students often see nesting mourning doves as well as yellow-rumped warblers. Under Rumble’s direction, the school has been integrating the Los Angeles natural world into both the physical campus as well as the school curriculum. 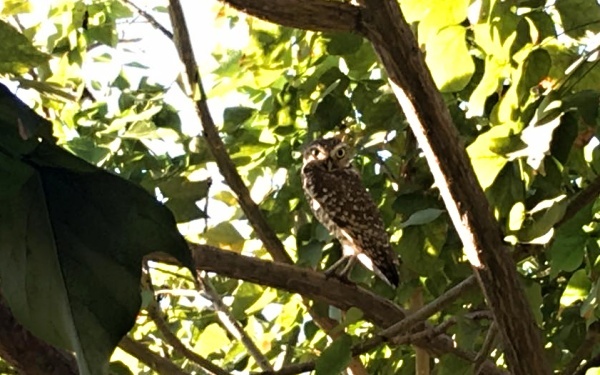 Finding a burrowing owl in a tree – in a busy urban area – is indeed a little out of the norm, but not unheard of says biologist Dan Cooper. In early November, the school re-wilded 5,000 sq. ft. of its campus, peeling up asphalt and, with the help of LA Audubon, planting natives. Nearby on Wilshire Boulevard, almost 4,000 sq. ft. was also recently restored with natives and other nature-attracting greenery courtesy of Rancho Santa Ana Botanic Gardens. There is even talk to change the official mascot of the school from the Esperanza Dragons to the Owls. Just as fierce? You bet. On weekends, the school campus has open playground time for kids and families; this Saturday, that playtime turned into an impromptu birding session that included watching the warblers, hummingbirds and, of course, owl. Esperanza’s owl was last seen investigating the new native habitat which thrills Rumble and the student body. There is talk of erecting an artificial burrow on campus to help the owl through the winter. The nearby jacaranda tree, where the owl is now perching, may offer enough insects for the bird to survive in the coming months.